As you age, your eyes are more vulnerable to conditions and diseases that can impair your vision. The development of cataracts is one of those conditions. Millions of people suffer from cataracts in the U.S. alone, most of which are seniors. If you suspect you may have cataracts, contact an eye doctor from Museum District Eye Center in Houston to schedule an eye checkup. The following FAQs about cataracts can give you a better understanding of this condition. A cataract is a cloudy or opaque spot that covers the lens of your eye, blurring your vision. When small, cataracts may have little impact on your sight. As cataracts expand, however, the cloudiness increases, causing a noticeable change in your vision. Who’s susceptible to getting cataracts? Cataracts are extremely common in people over the age of 55, although some younger people could come down with this condition. Various factors can cause cataracts to develop. As you age, your eyes may undergo chemical changes that cause cloudiness of the lens. Cataracts may also form due to eye injuries or disease. Excessive exposure to UV rays of the sun, smoking and the use of certain types of drugs can increase your risk of getting this condition. Cataracts can be detected by your Houston ophthalmologist during an eye exam. You may also experience vision problems such as hazy or blurred vision, loss of color perception or unusual sensitivity to light, which are early signs of cataracts. 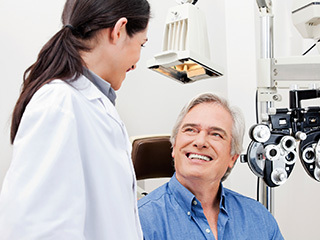 A visit to your Houston ophthalmologist will confirm cataract diagnosis. How do optometry specialists treat cataracts? In the early stages, cataracts rarely affect your vision. Your eye care specialist may suggest ways to protect your eye health to minimize the symptoms of the disease. Once cataracts start to affect your vision to the point where you can no longer partake of daily activities, your ophthalmologist will probably recommend cataract surgery. Modern advances in cataract surgery have made this procedure a safe and effective way to restore your vision. Your eye care specialist can let you know when would be the best time for this procedure. Is surgery the best way to treat cataracts? To date, cataract surgery is the best option for treating cataracts on a permanent basis and restoring clear vision. Your eye care specialist will operate on one eye at a time so you can continue using sight out of the other eye while your treated eye is healing. For an eye checkup to see if you have cataracts, contact an optometry specialist from Museum District Eye Center in Houston by calling 713-333-0151 today.